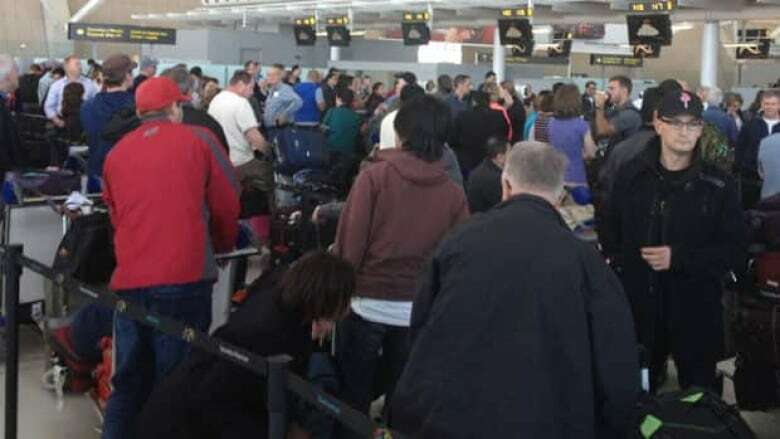 A group of about 200 tired, weary and utterly frustrated travellers arrived in Costa Rica on Saturday morning — survivors of a 17-hour delay at Toronto's Pearson Airport during Friday's snowstorm. But what led to the interminable delays for the Sunwing flight 794 — and what lessons are there for other travellers? In an interview with Daryl McWilliams, the vice president of media relations with Sunwing Travel Group, CBC News was given a blow-by-blow account of a series of problems that kept the plane on the ground and the passengers in their seats from morning until night. "It's a little technical," said McWilliams, "but bear with me and we'll get through it all." Flight 794 was scheduled to leave Pearson Airport at 7 a.m. local time Friday morning. By that time, the crew had checked in, the plane had been loaded, and the plane pushed back from the gate pretty much on time. According to McWilliams the aircraft then proceeded to the de-icing area. On a normal day Pearson's de-icing machine handles about 30 aircraft per hour. But on Friday something went wrong with the machine. The Sunwing aircraft got in the line "which was extensive." said McWilliams, and waited. The wait was about an hour and a half or two hours. "And during that time the de-icing machine — part of it malfunctioned. It dropped from being able to handle 30 aircraft and hour to eight." When the Sunwing plane finally got to the front of the line, the de-icing crew noticed that ice had built up on the engine cowlings (the covering) and the de-icing machine cannot handle that. "So [the aircraft] had to return to the gate for what we thought would be a fairly quick fix there. We would get our maintenance people to come out and remove the ice from the cowlings." But as the snow came down and the conditions worsened, the problems were just starting. "When we were coming back to the gate we were asked, 'Are you going to be de-planing the passengers, because the only gate we have is a U.S. gate? So you can't deplane the passengers," McWilliams said in a phone interview. McWilliams said the crew was finally able to get to a gate and get the ice problem fixed but while at the gate, "the snow went from light-moderate to heavy. Once it goes to heavy...you cannot push back from the gate. So now we're stuck at the gate." The passengers had been on the aircraft for about four hours by this time. "At around 10:30 a.m. we had been able to get some granola bars and juice and water onboard the aircraft," McWilliams said. "So then we finally got a break when the snow went to light and we were allowed push back. We went back into the lineup for the de-icing and that took so long, we dropped below the Transport Canada allowable limit for onboard fuel." Without the proper amount of fuel the aircraft couldn't take off. "So what is usually a brief period of time turned into hours and hours because of the queue and the de-icing machine." The aircraft got more fuel — but then another problem when it returned again to the de-icing machine. "The de-icing staff noticed that ice had built up on the brakes. So we couldn't even bring the aircraft back to the gate until we solved that problem." Sunwing wanted to send its mechanics to remove the ice from the brakes —but "that took four hours." "I know at this particular point in time passengers are very frustrated at what's happened — and everybody always thinks — why aren't they doing this, why aren't they doing that? That airport yesterday, to say it was congested is the understatement of the century. Not just all the gates with all the aircraft lined up, but personnel trying to move out on the tarmac on the aprons to get around. That's why it took four hours to get the maintenance crew to the aircraft to solve the brake problem." McWilliams said the situation at the airport was so extraordinary that at one point "the airport considered shutting down one of the runways to have a place to park aircraft." In some cases workers couldn't get to aircraft that were on the apron. "There were some times the snow got so heavy people were told, 'You can't go out. You can't move. No personnel allowed on the aprons." The passengers were told about some of the problems but not all, according to McWilliams. You know if you start talking to passengers about ... ice on our brakes there are some passengers who would say, 'Oh my God I want off. I'm not flying on an aircraft. "There's a fine line here between keeping the passengers informed and not alarming the passengers. You know if you start talking to passengers about ... ice on our brakes there are some passengers who would say, 'Oh my God I want off. I'm not flying on an aircraft.'" Passengers, he said, were told about "the big picture." Finally, after more than 12 hours in the cramped confines of the airplane, the end was in sight. "And this time we've requested a gate where we will be able to de-plane the passengers — and we waited an hour and a half or two hours to get a gate." "You have to realize," McWilliams said, "all the gates were jammed. The only way you're getting a gate is if an aircraft leaves. And the aircraft were few and far between that were leaving." By this time it was getting close to 8 p.m. When they finally got off the plane, passengers were given a $25 food voucher and a letter telling them they would be given a $150 per person discount on future trips "for the inconvenience they'd experienced during this day." Sunwing had run into another problem — the crew had worked longer than Transport Canada allowable limits. The airline had foreseen the problem but still had to switch crews. "We were originally hoping for 8:15 p.m. but we realized that wouldn't give the passengers sufficient time to take a deep breath and .. so we change that to 10 p.m."
But 10 p.m. became 10:50 p.m. — and then the plane had to face the de-icing lineup again. This time success and the flight left "sometime around 11:50 and midnight." McWilliams said the conditions on Friday were some of the worst ever at the airport and that Sunwing passengers will be experiencing delays throughout the weekend. "I'm making a guess that it will take us probably until Monday to catch up all of the backlog."